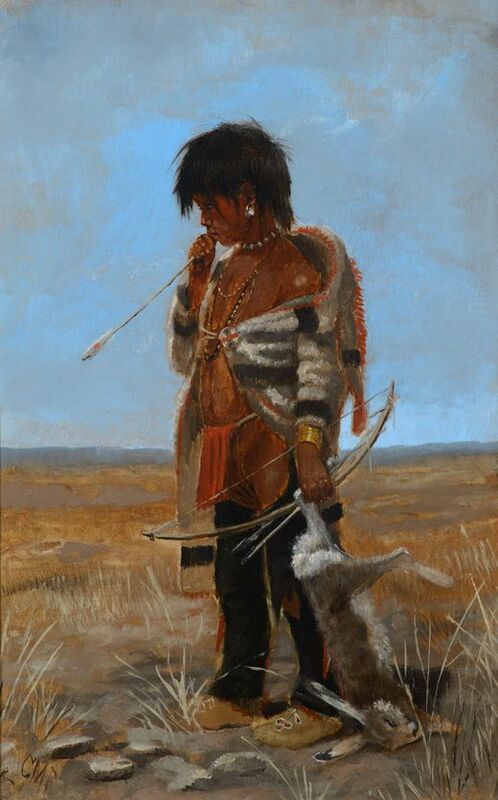 Jackson’s International Auctioneers in Cedar Falls, Iowa will be holding their two-day sale of World Treasures Featuring Important Russian, European Asian & American Works November 29th and 30th. The second day features over 200 lots of Asian antiques from China, Japan, the Himalayan Region and India. 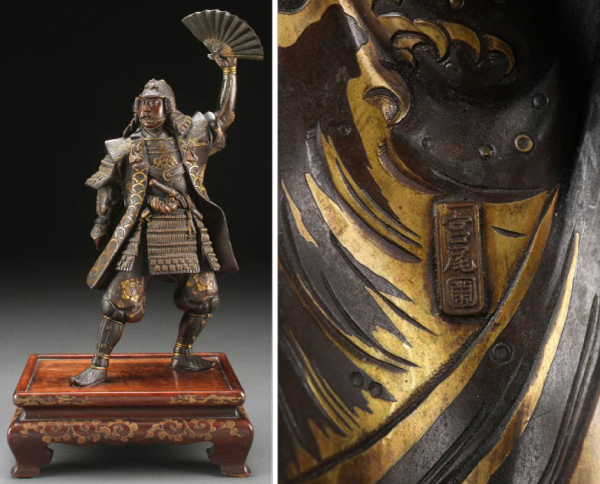 Despite a lull in the Japanese art market, Jackson’s is featuring two top quality items crafted during the peak of the Meiji Period (1868-1913). The first is lot 1258, a Very Fine Namikawa Yasuyuki Workshop Japanese Cloisonné Enameled Vase. The Namikawa studio is probably the most renowned workshop for crafting cloisonné enamel wares in Japan. Their vases typically have very detailed and complex designs, and were extremely limited in their production. This vase is decorated with attractive floral blooms intertwined with scrolling vines, all on a deep blue ground. The base and rim is mounted in silver, and the bottom bears the inscribed maker’s mark Kyoto Namikawa. 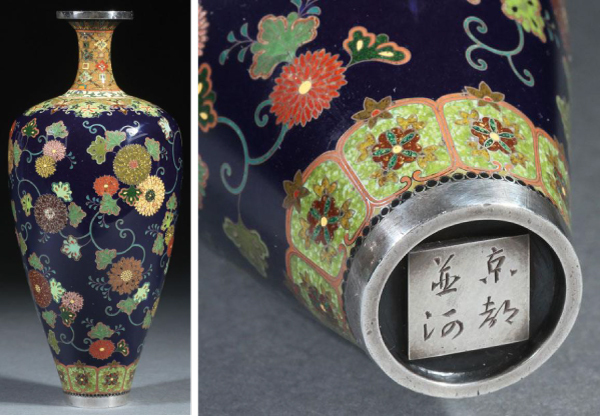 Namikawa cloisonné enamel vases are still extremely sought after in today’s market. This example has an estimate of $3,000-5,000. Not to be outdone is lot 1273, a Fine Japanese Miyao Patinated and Gilt Bronze Figure. The Miyao Eisuke Studio is famous for crafting large bronze sculptures that showcased traditional and mythological Japanese scenes. These figures are highly detailed and showcase a sense of realism that was attractive to American and European collectors. This figure is estimated at $500-1,000. Finally, Jackson’s will be featuring a collection of rare Asian Art reference books. 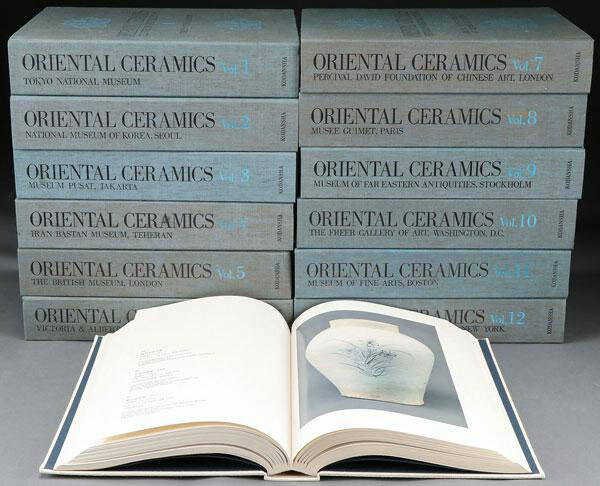 One of the most important is lot 1143, Oriental Ceramics: The World’s Great Collections. Limited to 300 copies, this extremely rare and complete set of twelve books from 1976 highlights some of the world’s most important Asian works of art from major museums. The institutions covered include the British Museum in London, the Metropolitan Museum in New York, and the Tokyo National Museum. This set of books has an estimate of $2,000-3,000. Browse the full catalogs for Day 1 and Day 2 in Jacksons World Treasures Featuring Important Russian, European Asian & American Works auction now. Browse upcoming Asian works of art at auction here.